WALO’s Dense Asphaltic Concrete (DAC) lining system is perfect for lining canals and irrigation systems as it is non-toxic, impermeable, very strong and still flexible. Large ships traveling though canals cause powerful waves but canals lined with DAC can withstand the pressure they create. Long side slopes in these containment systems are not a problem either, as WALO can line slope lengths of 150m using specially designed machines which have no need for regular joints – often a major problem for barrier systems. The main winch moves along the length of the channel on the crest, supporting a slope paver by means of wire winch ropes. The slope paver places the asphalt strip by strip, starting from the slope toe and working upwards. The asphalt is compacted by slope rollers secured by a roller winch. the material for the lining is supplied via the crest road. This is a very similar method to vertical slope placing but here the slope paver is installed parallel to the course of the channel. A main winch supports the paver and both mover together along the channel. As with vertical slope placing, the asphalt is compacted by slope rollers secured by a roller winch and material is again supplied via the crest road. A channel paver is installed in the base of the channel and moves along the channel course while simultaneously placing the material down the total length of the slope from the crest to the toe. The screed can be adjusted as required to the geometry of the channel. 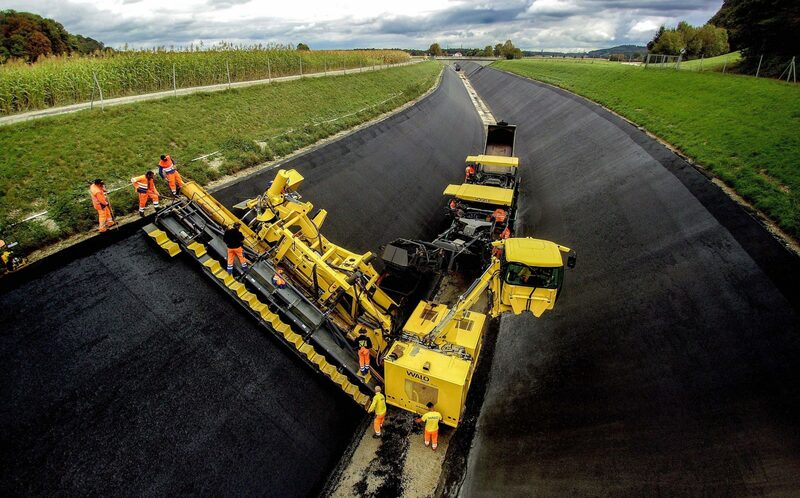 The asphalt is compacted by rollers supported by special roller winches, which are installed in the base of the channel and move along the channel course, following the channel paver. With this method, no crest road is needed as material supply is done via the base. Whichever construction method is used, the DAC is placed in a 2 – 3 inch (6 – 8 cm) thick layer. If required, a drainage layer can be installed underneath to reduce stress on the lining system from the pressure of water if the channel is constructed below groundwater level. The drainage layer can also be useful to assess the impermeability of the lining and track any potential leaks. As a final protective coating layer, a mastic seal coat can be applied to the DAC. This increases the longevity of the lining by providing protection against UV radiation and sedimentary damage.